A team of American soccer players with nerves of steel has defeated its Iranian foe in the final game of an annual football tournament, designed for humanoid robots which can play by themselves. In the final game between robots of the top size category which took place on Wednesday, a team called THORwIn, which was designed by the University of Pennsylvania, scored five goals, beating the Iranian team Baset Adult-Size, which managed only four, AFP reported. READ MORE: Robo-mission impossible? Talking robot on trans-US hitchhike stuck in Boston for 7 days! The players are not controlled by humans, and the whole show resembles a child’s game. The teams are usually divided into categories depending on their size. 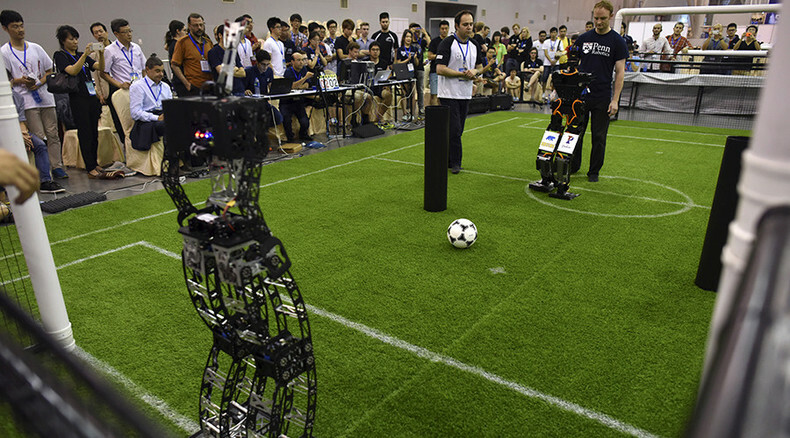 This year, Robocup or the international Robot Soccer World Cup, was held in China, in the eastern city of Hefei. It attracted 175 robot teams from 47 different countries, according to the China Daily newspaper. Scientists believe that Robocup, introduced in 1997, helps to encourage the development of machines which could be less human-dependent and more complex in their functions.